Alongside a press release detailing the improvements brought on by the update. 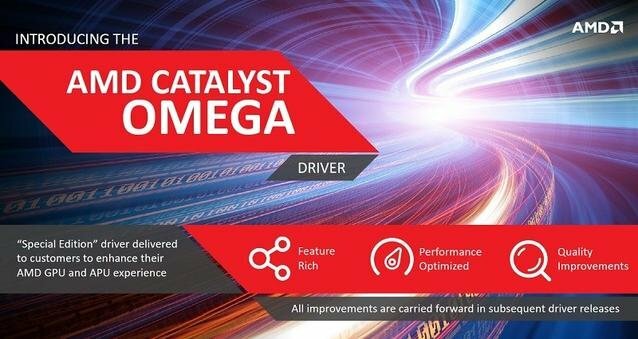 Earlier this month, we reported that information regarding the new Catalyst Omega driver update by AMD had been leaked– the leak made the update seem incredibly impressive, promising up to a 19 % performance improvement on high end cards, and 29 % on APU cards. Now, the update has been officially released, alongside AMD’s official press release for it, and while it is certainly not as powerful as our imaginations running amok may have imagined, it’s still a pretty substantial update, and should be much appreciated by AMD owners. The press release cites improvements such as UltraHD upsampling, so that games that max out at 1080p will be upscaled on 4K displays. There is also Perfect Picture UltraHD tech, which adds compression artifact removal 2, and frame rate conversion for Blu-Ray video, to process it pixel by pixel. Moreover, we are told that select AMD APU and GPU combinations will also work together via Dual Graphics, for considerably smoother gameplay. All of this, and the 29%/19% performance gains are also repeated, though AMD does add a new disclaimer here- these performance gains are in the opinion of their software marketing head Sasa Marinkovic; in other words, there is no empirical, hard number testing that can verify those percentage gains. In an era of false marketing, it is good to see AMD being proactive and being clear about something like this. And the percentage gains aside, this does look to be a pretty hefty update, so AMD owners should be happy.